The All-Clad Stainless Steel 10-Piece Cookware Set is one of the top-rated stainless steel cookware sets we see at retail sites, which is pretty impressive for an item in this price class. Its cost doesn't deter too many people, who consider it practically an heirloom. Flawless results from a high-end product. 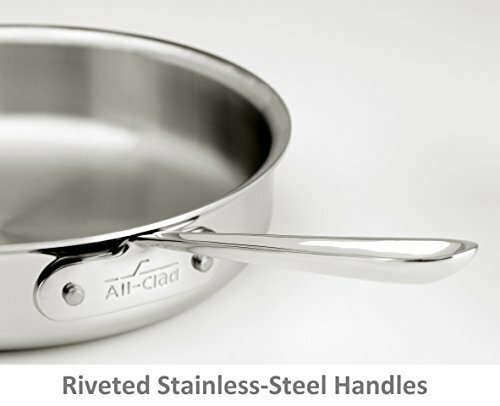 The pots and pans in the All-Clad Stainless Steel 10-Piece Cookware Set feature All-Clad's tri-ply construction -- two layers of stainless steel wrapped around an aluminum core. Moreover, the pots and pans are fully clad with the aluminum core extending up their sides, helping promote a more even transfer of heat. And, in expert testing, All-Clad easily outperforms the competition. It's the top pick at one professional test kitchen, with editors there giving it perfect scores for design, cooking and pan sizes. TheSweethome.com makes this All-Clad cookware set their upgrade pick, noting that it actually outperformed their top pick in even heating due to its "unparalleled heat conduction." Owners agree, saying this 10-piece cookware set is a top performer in any cooking situation. A number of reviewers say these pans have actually made them better cooks. There are some scattered complaints about sticking food, but most of those reviews have generated a number of replies from All-Clad enthusiasts with helpful tips for using the pans properly. A soak and a scrub and its good as new. Because stainless steel is not nonstick, reviewers say there is a learning curve to using any All-Clad cookware properly. Fortunately, there are many resources for doing so from All-Clad fanatics. As with any stainless steel cookware, a crust, or "fond" will form in the pan (as it is intended to), which means it needs more scrubbing than a pan with a nonstick surface. Most owners say to either use Bar Keepers Friend (Est. $7 for 12 ounces) to scrub, or just soak the pan for a few hours or overnight and then wipe it out. At TheSweethome.com, the All-Clad cookware was the set that "looked like new after cleaning." The pots and pans are dishwasher safe, but most experts and owners recommend hand-washing of any cookware. The stainless steel handles stay cool on the stovetop (but will get hot when used in the oven or broiler). A few owners are unhappy that this set does not include a 12-inch skillet (one is available separately and we review it here (Est. $120)), but most experts and users agree that this 10-piece set has a good selection of pots and pans in general and they have a cooking surface that is true to each pan. And, as TheSweethome.com points out, there are many other pieces you can add to this set to expand it. Professional testers name the All-Clad's construction "superb." 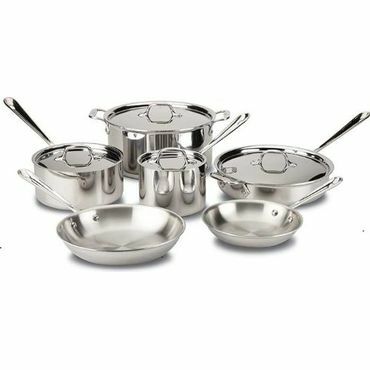 Handcrafted in the USA, the All-Clad Stainless Steel 10-Piece Cookware Set is described in reviews as hefty and sturdily built. The Sweethome.com dubs it a "buy-it-for-life cookware set." The pan's cooking surfaces are made of 18/10 stainless steel, which contains 10 percent nickel to improve corrosion resistance. The outer surface is made of magnetic stainless steel, which allows it to be used on induction cooktops. Many owners say their cookware still looks like new after years of use and quite a few say they hang their cookware to display, it's so attractive. This set is backed by a lifetime warranty, and unlike many manufacturers, All-Clad covers the cost of shipping damaged cookware back to them.